Are you looking for the ultimate residential walk behind mower? Honda’s HRX series has flexible drive systems, a high performance cutting system and an advanced composite deck. This makes it one of the easiest-to-use mowers on the market while also being able to mulch and bag clippings, even when the grass is wet. This mower is powered by Honda’s GCV190. It uses an overhead cam design with a resin camshaft and internal timing belt, keeping the engine light and the part count low. The result is less noise and vibration without compromising performance. Automatic decompression makes this engine easy to turn over, and an automatic choke means you can start mowing as soon as the engine is running. Some models also come with an electric starter. It’s powered by a small handle-mounted battery that charges off of the engine’s electrical system. The deck comes with Honda’s 4-in-1 Versamow system with modes for rear discharge, mulching, bagging and leaf shredding. The Clip Director lets you vary how much grass is mulched and how much is bagged, letting you mulch the maximum amount of grass without clumping. Cutting is handled by a pair of MicroCut blades. With each pass, these blades trim the grass twice, improving the finish and making clippings more compact so the bag needs to be emptied less often. The deck is made out of NeXite, an extremely strong, durable plastic similar to the materials used to make car bumpers and the outside layer of football helmets. Because this deck is cast as a single piece, it can be made at higher tolerances than a metal deck, resulting in an increased vacuum and air circulation for better mowing performance. It’s also nearly impossible to crack the deck, it won’t dent and it can’t rust. Honda is so confident about NeXite’s performance that they back it with a lifetime warranty. Two versions of the HRX come with Honda’s trademark Roto-Stop system. This disconnects the blade shaft from the crankshaft and stops the blade. That means you can safely walk away from the mower to dump clippings or move a branch out of the way without having to restart the engine. Select Drive lets you set a speed range using the knob on the handle. From there, you can squeeze the handle to engage the drive system and get the speed you want. The hydrostatic drive system comes with cruise control to set your operating speed. Pull the bail, and the mower starts rolling. If you have to stop for a moment, it will return to the previous speed without having to make adjustments. With both models, the maximum drive speed is 4 MPH. 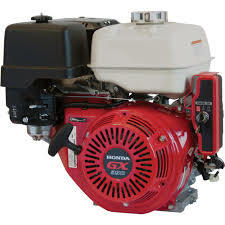 The NeXite deck comes with a lifetime warranty, while the engine is covered for three years of residential use. The rest of the mower is covered for 5 years. 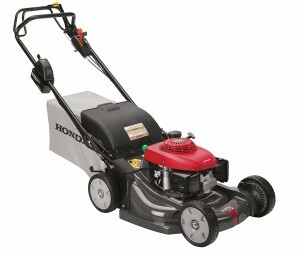 You can get everything you need for your Honda mower straight from your browser: just visit www.hondalawnparts.com. As a certified dealer, we’re able to ship OEM parts to any address in the U.S. or Canada. Finding parts is easy, too: just select your model and serial number, and our site can show you parts diagrams for your model, letting you see where everything fits. Which Snowblower is Right for You? It’s that time of year again: the leaves have fallen and the grass has stopped growing, replacing lawn care with snow removal. 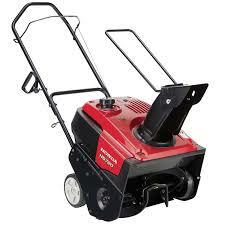 What Honda snowblower will fit your needs? A single-stage snow blower uses one auger to pick up snow and push it through the chute, while a two-stage snowblower adds a second auger to push snow through the chute. This lets two-stage blowers throw snow farther so they can clear larger areas. Honda’s single-stage blowers can throw snow up to 33 feet away, while their two-stage blowers can throw snow between 49 and 56 feet away, depending on the model. Honda’s single-stage snowblowers are “semi-self propelled.” There’s no drive system, but the action of the auger digging through the snow helps pull the machine along the ground, reducing the force needed to push the blower through the snow. All two-stage snowblowers except the HS1336iAS come with a hydrostatic drive like you’d find on a riding mower. The wheels are driven by a hydraulic system that can be infinitely varied to get the speed you want. The HS1336iAS uses a hybrid drivetrain. The engine powers the augers, while electric motors power the tracks. While there are efficiency benefits to this system, its biggest advantage is the motors’ ability to deliver maximum torque as soon they start moving. This keeps the blower rolling in situations that would bog down other equipment. It also has a transport mode, allowing the snowblower to be moved around without starting the engine. The HSS1332AT, HSS1332ATD, and HS1336iAS use a track drive system, which gives them the grip needed to clear snow on inclines. The HSS928AWD, HSS1332ATD, and HS1336iAS all have electric starters. Unlike most snowblowers on the market, these starters are powered by the on-board batteries, so there’s no need to plug it into an outlet. All other models use a standard recoil starter, but since the engine has an automatic decompression system, they’re easy to turn over, even in cold weather. A snowblower has a maximum snow height it can handle and a maximum width it can remove with each pass. While it’s technically possible to reach the maximum width and height, the actual amount it can handle without bogging down will depend on snow density, which can vary a lot: a cubic foot of light snow may only weigh 7-8 pounds while the same amount of hard pack snow can weigh well over 20 lbs. To make apples-to-apples comparison easier, Honda includes a pounds-per-minute rating, which is how much snow the machine can move regardless of depth. All things being equal, a snowblower with a higher pounds-per-minute rating will be able to cut through a wider strip of snow with each pass. Honda’s smallest model, the HS720AM, uses a simple chute control: the height is adjusted using a pair of bolts, while the direction can be changed by turning the chute using the handle. Most models come with Honda’s Snow Director. This uses two levers mounted on the handle to change the direction of the chute and the angle of the opening to drop snow exactly where you need it with each pass. The largest models use a power tilt system with similar controls. No matter which Honda snowblower you end up purchasing, you can get everything you need for it from skid shoes and shear pins to major components from www.hondalawnparts.com. 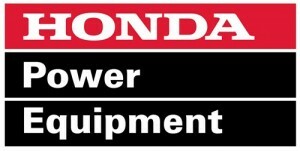 We’re a certified Honda Power Equipment dealer, which lets us offer the full line of OEM parts. Finding what you need is easy thanks to our advanced search engine that has built-in factory diagrams and descriptions. We can ship your order to any address in the U.S. or Canada. 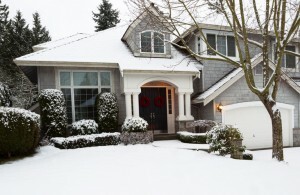 While your lawn might not be foremost on your mind with winter coming, snow and cold can do serious damage. By making preparations now, you can reduce the effects of moisture, cold and snow mold to help your grass come back full and lush next spring. Left undisturbed, fall leaves can create a thick mat of rotting material that blocks air and sunlight from the grass, keeping it from absorbing the nutrients it needs to survive the winter. Once it starts snowing, this layer holds in moisture that encourages the growth of snow mold. Honda’s mulching mowers are designed to handle large amounts of lawn debris, even if it’s wet. If you mow frequently as the leaves fall, you’ll be able to turn those leaves into mulch, feeding the soil and reducing the money you need to spend on yard waste disposal. Expect to mow at least twice a week at the peak of the season. If the number of leaves gets out of hand, you should collect and dispose of them either by creating a mulch pile or by having them collected as yard waste. By now, the time for fall fertilizing has passed in most of the country, but if you’re still a few weeks away from winter, now is a good time to get a soil sample tested so you can use the right mix on your soil. Nitrogen is emphasized in fall fertilizer mixes to encourage chlorophyll production and the resulting sugar stores needed to survive the winter, but too much can promote the growth of snow mold. This makes it critical to get the right balance to supplement your grass without opening it up to infection. The less grass you have, the less moisture it can hold. Ideally, the blades should be around an inch in height, but you may need to go a little higher to keep from cutting into crowns. Remember never to mow more than 1/3 of the grass blades at one time. Warm season grasses should stop growing after the first freeze, while cool-season grasses may grow just enough to need one more mow after the initial freeze. Both warm and cool season grasses should stop growing once temperatures are regularly below 40°F (4-5°C) and enter hibernation. Photosynthesis shuts down, the blades of grass turn brown and the plant starts using the sugar stores collected through the later summer and fall. In this state, the grass is very sensitive to damage, especially if it’s covered in frost. At this point, the grass shouldn’t be mowed; walking and any other contact with the ground should be kept to a minimum. When most of us use our snowblowers, we simply aim the chute to get the snow away from the area we’re clearing. This centers the snow on one area, creating a pile that is thermally insulated, slowing down the melting process. In turn, it keeps the ground underneath wetter longer, encouraging the growth of snow mold and the washing away of mud surrounding the grass. To keep this from happening, try to adjust the chute angle to drop the snow in a different spot with each pass, spreading it out over a wider area. 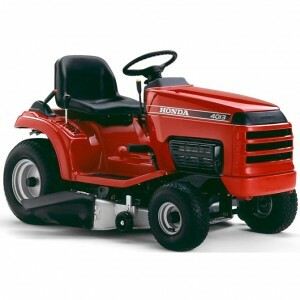 If you have Honda power equipment or a Honda small engine, you can get everything you need for it at www.hondalawnparts.com. We’re a certified dealer for both arms of Honda’s outdoor equipment division, letting us ship OEM parts across the U.S. and Canada. In most Honda engine manuals, there’s a section called “Carburetor Modification for High Altitude Operation.” This simply states that “specific modifications” need to be made for the motor to run correctly at higher elevations. What are these modifications, and why do they need to be made? What Does Altitude Have to Do With My Honda’s Carburetor? The higher you are, the less dense the air is. Local air density can vary depending on temperature and humidity, but, all things being equal, the air at an elevation of 10,000 feet is one-third as dense as the air at sea level. During the intake stroke, the piston moves down, filling the cylinder with air. If the air is less dense outside the motor, there will be less air inside the cylinder, even if the volume stays the same. If there’s less air in the engine, there needs to be less fuel to get the right air/fuel ratio. The main jet and pilot jet determine how much fuel is added with each intake stroke, and it doesn’t vary even when the amount of air does. Honda sets up their carburetors from the factory for use at low altitudes, which makes the mixture much too rich at higher elevations. How Do I Get My Engine to Work at High Altitudes? The pilot jet, which provides fuel when the engine is idling, can be adjusted by screwing it into or out of the carburetor body. The main jet, which provides fuel when the engine is running at speed, needs to be replaced with a smaller jet. What size of main jet do you need? Fortunately, Honda has already figured that out for you and offers carburetor jet kits designed for specific altitude ranges. For most engines, there are three jet options: one for sea level, one for elevations starting at 5,000 to 6,000 feet and one for elevations above 7,500 to 10,000 feet. How Do I Change Jets? If you’ve changed jets on a car or motorcycle carburetor, this process should be familiar. First, remove any gas from the carburetor. Depending on the model, this may be as simple as closing the fuel line and running the engine until the fuel in the carburetor is used up, or it may require draining the fuel system through a port on the bottom of the carburetor float bowl; consult your engine manual for instructions. Once the carburetor is empty, unbolt it from the engine. The screws on top of the carburetor can be removed and the unit can be separated into two halves. On one-half, you’ll see the main jet, located in the center of the body, and the pilot jet, located near the side. Both jets are brass with a wide slot designed for a flathead screwdriver. Unscrew the main jet and screw in the jet included in the kit. Turn the pilot screw to the position specified in the service manual to match the jet kit you are using. Reassemble the carburetor and reinstall it on the engine. Why Does My Engine Make Less Power at High Altitudes? Internal combustion engines make power by detonating a mixture of fuel and air. Even with the correct jetting, there is less fuel and air in the engine at higher altitudes, which means less power can be made. On average, the motor will lose 1.5% of its output for every 1,000 feet above sea level. I Use My Honda Engine Near One of the Altitude Limits. Which Jets Should I Use? Using jets that are too small will cause the engine to run lean, leading to high combustion temperatures that will cause the engine to overheat. It’s safer for the engine to run rich using the larger (lower altitude) jet, although Honda designs these kits with some wiggle room: a 5,000 ft. kit should work at altitudes as low as 3,000 feet. How Do I Tell if I Have the Wrong Jets? Honda recommends that installers place a tag on or near the carburetor that notes the change in jet size. If you’ve bought a used engine that is running lean or rich and you suspect the jet has been changed, open up the carburetor and remove the jet. There should be a small number on the side that specifies the jet size; if it doesn’t match up with the jet kit for the altitude you operate at, it should be replaced. Where Can I Get an Altitude Kit for My Honda Engine? 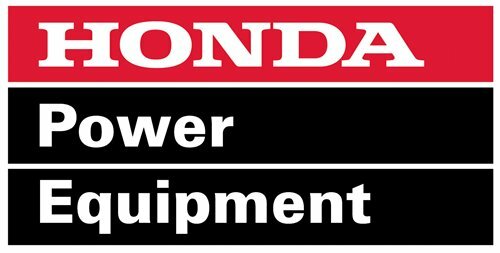 www.hondalawnparts.com is a certified Honda Small Engine Equipment dealer, so we carry everything you need for your engine from jets to complete carburetors. Our site uses factory parts descriptions, making it easy to determine which jet kit is right for your engine’s carburetor. We can ship what you need to any address in the U.S. and Canada. Have a Honda H4013 lawn tractor? It may be an older model, but there’s no reason it can’t still be kept in service with the right maintenance. This guide will help you identify common problems and the parts you’ll need to fix them, whether you’re a long-time owner, or just bought one. 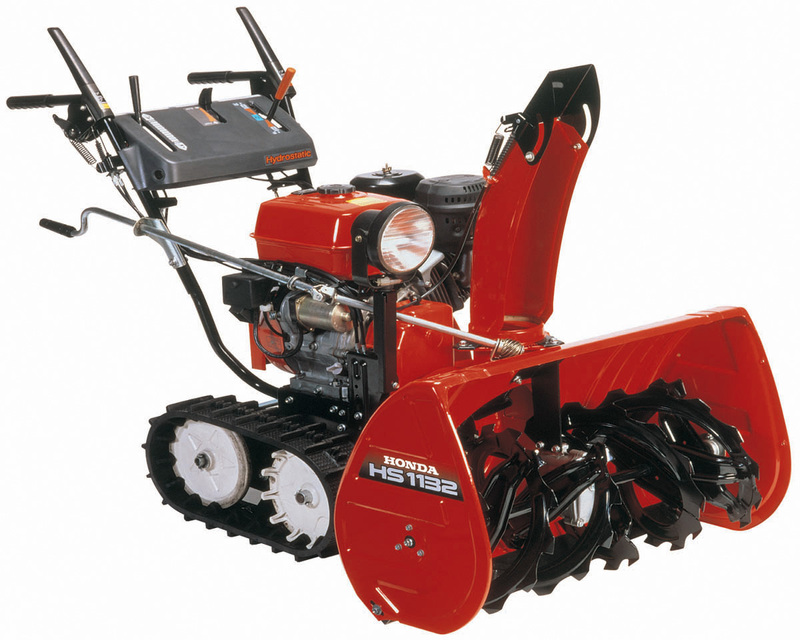 The Honda HS720AM Snow Thrower is an excellent piece of yard maintenance equipment that, if used carefully and correctly, will provide years of service for its owner. The safety and efficiency of your machine are dependent on your direct oversight and care, so it’s a good idea to familiarize yourself with the details of its operation. Safety should always come first. It’s very important that you read carefully the safety warnings that are listed on the machine itself, as well as in your operator’s manual. Failure to follow these warnings can result in damage to the machine, as well as serious injury to yourself or people around you.